Digital Arts Center Video & Editing Professional Certificate Program UCSD Extension Fall 2012. Cilley’s list of accomplishments is as extensive as it is unique. She has worked and lived on both sides of the border, teaching bilingual video production classes and producing dozens of short documentaries that explore social justice themes such as illegal immigration, tenant’s rights, safety and health in impoverished communities and the struggles of undocumented youth in the US. She is the owner and operator of her own video production company, VideologiCo, and she has taught video production for the past 8 years and currently teaches at the Media Arts Center San Diego and Platt College. She is one of the founding members of the San Diego Student Film Festival and will be directing and expanding the festival this year. Cilley has produced and directed a number of short films with supernatural themes–recently zombies, vampires and ghosts. 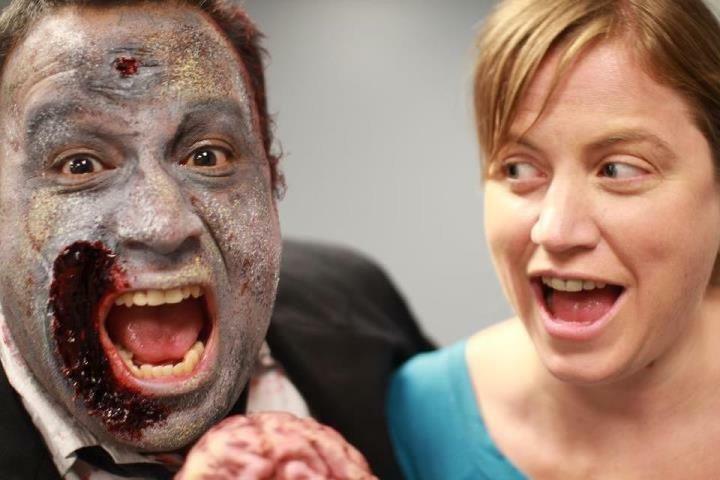 She has quickly become a household name to zombie fans in San Diego and has been able to bring together hordes of zombies for various film projects including a KPBS fundraising video and a commercial for a LA Based credit union. She is currently working on writing and producing a post apocalyptic zombie web series. Her credentials include a MBA from SDSU with specializations in Entrepreneurship and Management, a BS in Sociology from Boston College, and a Certificate in Video and Film from San Diego City College. She has been featured on Univision, TV Azteca, KUSI, SD Insider, KPBS, NPR, Radio Hispana as well as in Reviewer Magazine, San Diego City Beat, San Diego Reader, and the San Diego Union Tribune. Most of all Cilley is known for her passion for the arts, her dedication to education, filmmaking, and adventure. She spent over 6 years living in Tijuana, MX and has traveled extensively to destinations most travelers steer clear of such as India, China, Japan, Morocco, Thailand, Brazil, Peru and Mexico. Those interested in taking classes, getting involved or otherwise learning what’s happening at UCSD Extension’s digital arts program can check them out at http://dac.ucsd.edu/ or join the facebook page at https://www.facebook.com/UCSD.Extension.Digital.Arts.Center.